What was likely the toughest night of Russell McMurry’s professional life, March 30, 2017, started off pretty well. The long legislative session was coming to an end, and things were looking good for his department. So the state’s DOT commissioner headed home to Buford. “I actually walked in the door of my house and the TV was on to the news,” McMurry recalls. “The breaking news was a fire on I-85.” His first thought was that it was probably a car fire, a fairly common occurrence and not necessarily a big concern. It was the beginning of a long, anxious night and a longer traffic ordeal, as the fire fed on plastic pipe stored under an interstate bridge in Buckhead and ultimately caused the bridge to collapse. Thanks to first responders, no one was killed or injured; but the incident destroyed 350 feet of highway – both northbound and southbound – closing a total of 700 feet of interstate used by nearly a quarter of a million vehicles every day. The blaze allegedly started when a man set fire to a chair atop a grocery cart beneath the bridge; flames spread to the plastic, which burned very hot and brought about the collapse. The recovery and rebuilding effort tested both the patience of Atlanta commuters and the mettle of the man responsible for the reconstruction. But barely six weeks after the fire, the bridge was rebuilt and the interstate was again open to traffic. “It was a total team effort,” McMurry says. But it was he who became the face and voice of the recovery effort, despite being what Michael “Sully” Sullivan, president and CEO of the American Council of Engineering Companies of Georgia (ACEC Georgia), calls “a work horse, not a show horse, someone who prefers to work behind the scenes making things happen,” rather than seeking the limelight. “It benefits everyone in Georgia to have Russell and his calm, steady, visionary leadership at the head of the department,” Sullivan says. He believes McMurry’s skills go well beyond crisis management and are key to dealing with the state’s transportation needs. Third District U.S. Congressman Drew Ferguson, speaking at the Georgia Transportation Summit this fall, drew applause from the 1,200 attendees when he called McMurry “a rock star” with a growing national profile. McMurry is a native Georgian, an honors graduate of Georgia Southern University and a civil engineer who has been with GDOT since 1990, having served as planning director and chief engineer. For his leadership in handling an emergency and addressing the transportation challenges of a growing state, Russell McMurry is Georgia Trend’s 2018 Georgian of the Year. The first thing to know is this is not your grandfather’s highway commission McMurry is leading. Its role goes well beyond simply paving roads and building bridges – although it certainly does that. The department is involved in railroads – it owns more than 400 miles of short line tracks – and aviation – it administers funds and grants to the state’s airports. It works with local and regional transportation agencies and with the Georgia Ports Authority, playing a major role in the Savannah harbor project. And, no small task, GDOT is charged with finding transportation solutions that are crucial to the state’s continued economic growth. It is a critical time for Georgia, but a hopeful one, as many state leaders are taking a less parochial view of mobility problems in and around Atlanta than in the past and are even embracing the idea of mass transit and other technology-enabled remedies. McMurry and his department take the broadest view of their transportation responsibilities at a time when resources are being put to the test, despite a $3-billion budget. “We are now the smallest we have ever been in our history,” he says, “right at 3,800 full-time employees and about 150 part-time employees. When I started at DOT a long time ago, we were somewhere around eight or nine thousand. We’re having to evolve to work more effectively and efficiently. McMurry conveys a steady optimism, with a management style that embraces technology but values personal relationships. He is savvy about the way state government works, especially his own department, which is governed by a 14-member board elected by a majority caucus of General Assembly members from each of the state’s congressional districts. McMurry says the game changer in addressing transportation needs is the Transportation Funding Act of 2015 – HB 170, which provides nearly $1 billion annually in dedicated funding for infrastructure, including increased maintenance, roadway resurfacing and safety projects. “In my opinion,” McMurry says, “that was the single most important infrastructure vote in our state’s history – besides the creation of the excise tax to fund transportation initially back in 1916.” That distant vote created the State Highway Department, which became the State Highway Commission and then the Department of Transportation in 1972. Good thing, because the state’s needs are significant. “We have to provide first-quality infrastructure to all of Georgia – rural Georgia as well as metropolitan areas throughout the state and Atlanta,” McMurry says. But the traffic challenge is growing: “Mobility in Metro Atlanta is a big issue,” McMurry says. Various rankings put Atlanta between fourth and 13th worst in the nation for traffic congestion. The INRIX Global Traffic Scorecard ranks Atlanta ninth worst in the world out of 1,064 cities for driving time spent in congestion. McMurry is enthusiastic about the technological developments that promise help in solving traffic problems, but he is especially gratified by what he sees as a new attitude among state leaders. 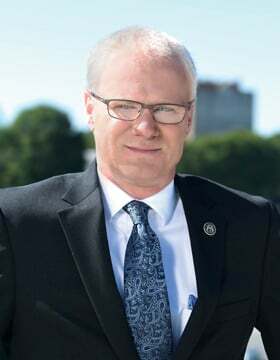 He references the creation of the Georgia House Commission on Transit Governance and Funding, a pet project of Speaker David Ralston, on which McMurry serves as an ex-officio member. He says it is crucial that mass transit be user-friendly and coordinated with busy interstate routes. Some of the most exciting work the department has done in a decade, he says, comes as a result of the Major Mobility Investment Program, consisting of 11 initial projects identified to transform mobility. It was first announced in 2016. “We will begin to build an express lane system so you can traverse the region in a predictable manner and have a predictable experience,” unlike that of an automobile commute that may take 45 minutes one day and more than an hour the next. “The program actually takes I-285 and makes it sort of a hub of express lanes that have spokes that radiate outward – to 75, 400, 85 – and provides mobility options and corridors for different forms of transportation – like bus rapid transit. Drivers can still choose the express lane and pay the fluctuating toll rate, but the transit user, McMurry says, “can ride on a bus connected to Wi-Fi and work, watch Netflix, take a nap – and get there quicker all for the same fare they were paying before. “Technology will continue to play a huge role because of being able to move seamlessly from bus or express bus to maybe a MARTA heavy rail station.” Once riders reach their stop, they may be able to go the last few blocks to their workplace via autonomous shuttles – self-driving mini-buses. “That can be a reality in the short term,” he says. “The technology that exists today is beginning to be implemented. McMurry is a believer in good old-fashioned personal relationships. He says they paid off handsomely during the I-85 bridge collapse and response. “It’s like any sports team. You don’t just show up and expect to be successful; the success goes back to longstanding partnerships.” Those come from two different directions – regional and state. The regional partnerships came out of the failed Transportation Investment Act (TIA) initiative in Atlanta in 2012. Throughout the process, GDOT, MARTA, the Georgia Regional Transportation Authority (GRTA), the Atlanta Regional Commission (ARC) and the city of Atlanta worked closely as they were going through the process of the referendum, prepared to deliver quickly if the measure passed. On the state level, he credits Gov. Nathan Deal for pulling the agencies together. “It goes back to the experiences from a painful time – Snowmageddon,” the 2014 winter storm that wreaked havoc across the city, and the resulting changes that better prepared officials for an effective emergency response. When the bridge went down, the assembled leaders began to understand the scope of the project they had on their hands. “Our DOT team and our bridge engineer started that Thursday night and had to work around the clock to redesign 700 feet of bridge,” McMurry says. The old plans couldn’t be used, because the original beams from the 1980s are no longer made. By early Monday morning, new plans were ready, and the department could assess what the cost would be and how long the rebuild would take – aiming initially for a June 15 completion. McMurry then briefed Deal, and it was during that meeting that the notion of a monetary incentive – ultimately totaling $3.1 million – surfaced. The commissioner recalls the governor’s request and his own response: “I’d like you to see if you can apply business principles here and incentivize them to work even harder,” Deal said. And so he did. Calculating the cost of vehicle operation and operators’ time for the 243,000 drivers who would no longer have access to the damaged portion of I-85 and would be traveling extra miles, using detours on I-75, I-20 or I-285, the department came up with a daily road user figure that ranged from $800,000 to $1 million in additional costs for each day the roadway was closed. The incentive worked. C.W. Matthews, the contractor, worked around the clock to meet the Memorial Day weekend target date and actually beat it. The northbound lane opened May 12, and the southbound lane on May 13 – more than a month earlier than the original projected completion date in June. McMurry made the determination early on that the department had to be open and keep the public informed – both on traffic issues and rebuilding progress. He made himself available to the press, and Construction Director Marc Mastronardi gave regular briefings. It was important, McMurry says, that media have access to the site and know what was going on. He jokes that if a project worker went to the port-a-potty, the department was prepared to send out a news release. An investigation, involving the National Transportation Safety Board and others, is not yet complete, but McMurry is confident. “We have found that, to our knowledge, [the material stored] doesn’t violate any fire codes or storage policies.” But the fire was a wakeup call, and he quickly advised his counterparts across the country to check their under-bridge storage areas.